It's been quite a while since my last post. There was the usual busy rush of holidays of course, compounded with seasonal colds and the cross-country trek we make each year to see our extended family. There was an unexpected hitch in our plans though, when one of the twins got so ill that we needed to take him to the hospital. We received the news that our son has Type 1 Diabetes, which is an auto-immune disorder where his body attacks its own insulin-creating cells in his pancreas. Apparently brewing silently for some time, the stress of being sick plus the rigors of travel triggered a crisis for his body and the Type 1 Diabetes announced itself with a five day stay in a children's hospital 3000 miles from home. The last two months have brought some of the biggest challenges since I became a parent as we learn how to measure his blood sugar, calculate and inject doses of insulin, and generally learn a whole new way to structure our lives. It's very much a manageable health condition, and my son is doing a wonderful job acclimating to this life-long change. When my husband and I were in the hospital with him, our other two children were safe and happy with cousins and Aunts and Uncles. When he was finally discharged from the hospital, we had a week long stay with my parents who were a great help and support. As far from home as we were, we got great care. We have wonderful health insurance, which is an indispensable blessing I wish for everyone. The twins just turned 11 years old and are safe and happy. Our child can continue to do all the same things as other kids his age, albeit with a bit more planning and preparation. 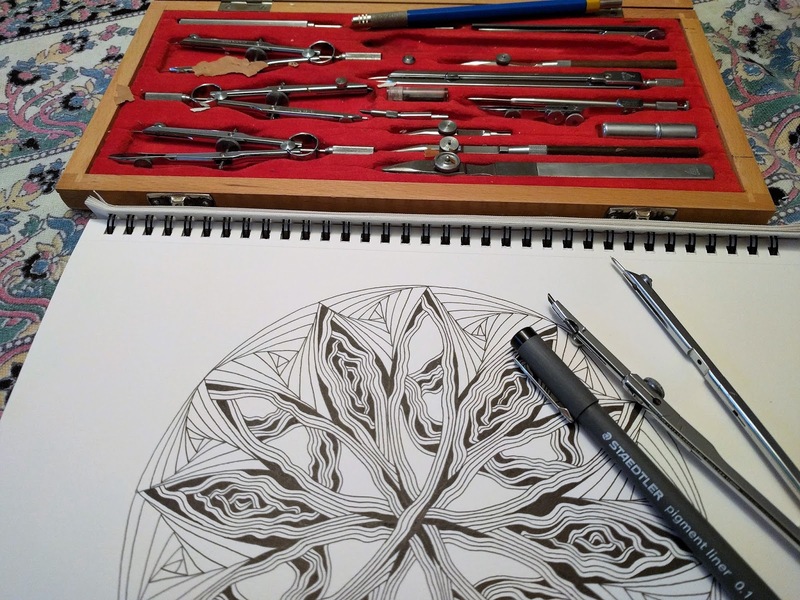 And I even received an art blessing over the holidays, as my father passed on to me some beautiful drafting tools he's had since his college engineering days. You can see them here, next to the zendala I created using a compass from the set. 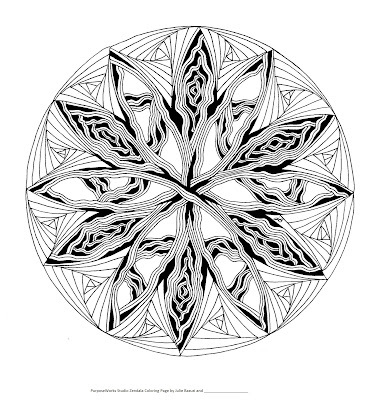 There's something very satisfying about the high contrast of black ink on white paper, and it was especially soothing to blend the mandala-style radial symmetry with the organic nature of Diva Dance. 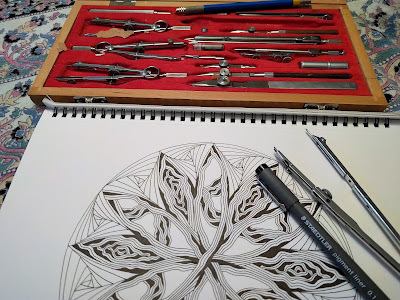 I'm so grateful to finally carve out time to create again and to return to the meditative process of Zentangle. Let's try something new for the new year. 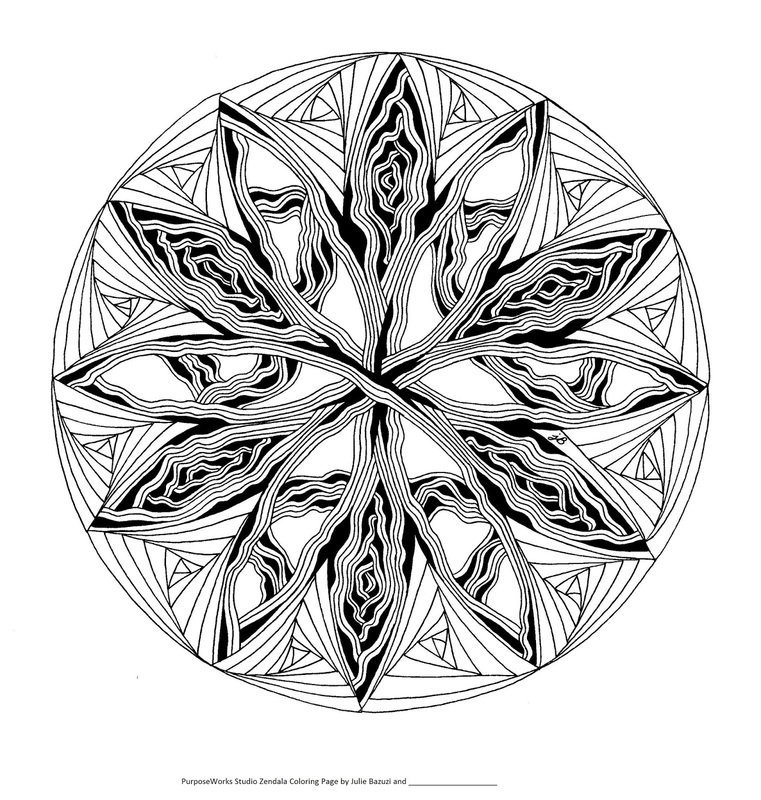 Here is a version of my Zendala that you can print out and color or shade as you wish. There is a little space next to my initials where you can add your add your own as you put your mark on our collaboration. If you try it out, please post it on your blog, Instagram, or other social media site and leave the link in the comments below so I can see it! I love how you incorporated the challenge into a Zendala. It's very pretty. I'm glad your son is doing better. I love your duotangle done as a Zendala; it's beautifully drawn. And lucky you, to be gifted with all those marvelous tools! Thank you for allowing us to collaborate with you. As soon as I get some ink to print it out, I will be printing it. I'm glad that your son is doing okay. Yes, thanks to medicine, diabetes is one of the more manageable health conditions. I'm so glad to see you back on the Diva's site. Reading your post is always a nice surprise and again, you show us a wonderful work. I love your Zendala very much. Diabetes is something serious and your son has to deal with it during his whole life but, as Lezli wrote, thanks to a good medical care, your son can have a long and happy life. I'm glad your know exactly what was going on and that, most important of all, he feels better now. I wish you and your familiy all the best for the future.